Ludum Dare has taught me so much as a developer, and has inspired a great deal of my work. Today, I released my first game on Steam–Skyway. If you have a few minutes, please check it out! Every vote counts! And if you aren’t able to vote, feel free to share the page! I’ll be doing more detailed write-ups in the following days, so be on the look out for those. I’m still hard at work on my latest game Skyway, which you may remember. I’ve just made an IndieDB page which will hold screenshots and updates! The game is a bit behind schedule but it should be officially announced sometime this month, and should release before 2017. Please check it out! I’m pretty worried about what people will think of it come announcement time, so feedback is appreciated! If you haven’t already, follow me on Twitter, and good luck to everyone in the LD! New Game in the Works! Hello LD! It’s been quite a while since I’ve posted here, and sorry to barge in on the Mini LD 😛 You might remember me from 2013. And from previous entries! The past few years I’ve been working on huge games and then scrapping them due to immense scale/poor time budgeting. I think that’s something many of you can relate to. It seemed like every project I started, I reduced the scale by half and it was still out of my scope But I finally sat down and really thought about the whole process. After a bunch of failures and coding practice, I came up with a solution. Making games is an iterative process. Instead of holding on to everything until release, I’ve decided to show more of my works in progress. And instead of fine tuning the gameplay for ages, I’ve decided to just literally make the game–no matter how bad it turns out. Iterative means once I have the whole thing done, I make improvements to everything until I’m satisfied. It took me way too long to figure that out, and it’s an ideology that really helped me in my projects. Without further ado, here’s a work in progress showcase of a game I’m working on called Skyway! Be sure to follow me on Twitter for bi-weekly updates on my games! As you can tell, the past several months for me have been about improving my games in terms of graphics and visuals/effects. I’ve learned that detailed worlds take hours and hours of hard work detailing even the smallest, unseen items. And I’ve learned tricks to work around modeling every item, such as repetition and implication. However, I’m not here to talk about my new game, I’m here to ponder why the gaming community has changed, specifically within the past year. Why are people so obsessed with graphics? E3 2015 just ended, and all I heard about the smaller games was “What??? This is 2015, games should look better! !” I’ve seen hundreds upon hundreds of comments about Fallout 4 and how it looks “bad” or “I’m not getting this because it’s no better than Skyrim.” Now whether you think Fallout 4 looks bad or not, the point here is why care? When Minecraft was released did people bash it for its graphics? No, because the focus was on gameplay and innovative mechanics. There was also a stylistic decision to the 32-bit look. 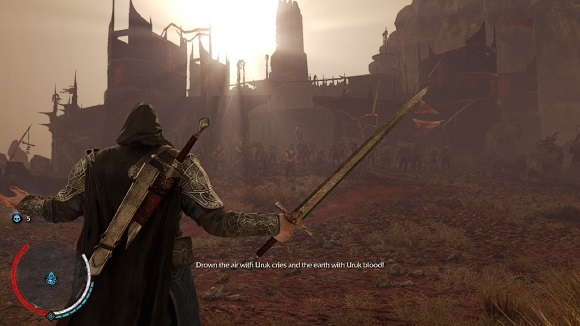 When I play a game, for example Shadow of Mordor, I don’t play to watch stunning visuals. Sure, it’s awesome to have something that’s nice to look at, and the particle effects make gameplay more satisfying, but in the end… I play to unlock more upgrades. Or I play to advance the story. Or I play to see all the unique bosses generated. Some developers have claimed that graphics pull in the audience, and mechanics keep them there. But why has it become a competition? Why are downgrades and optimizations and particle counts making/breaking the game for some people? Why does it matter what resolution your shadows are or how many polygons your characters have? I’ve always gone by the rule that the graphics in your game should fit your game. But I’m seeing people that hate Watch Dogs because the shadow quality was lowered for the final release. And I just don’t understand why. People don’t seem to want to accept any framerate lower than 60 for anything, even if it means not playing one of the most anticipated games of the year. And I don’t understand why it matters in the slightest. As someone who grew up with games running in a 400×600 window, I can get immersed in any decently made game, no matter the resolution or framerate. I played Mount and Blade with a constant 23fps in 400×600 stretched fullscreen just a year ago, and it’s still my favorite multiplayer game of all time. What is it about gamers these days that they won’t accept lower specs? It’s not even that they care about the gameplay or mechanics… they just care about the graphics and the “hours of gameplay”. They want something that looks good and lasts a long time with “new content”. Maybe it’s just because I’m a developer, and this is hate towards developers… Or maybe I’m not as spoiled as some of the gamers out there nowadays. But to me everyone seems to be angry. Why do Gamers hold Grudges against Companies? Finally, I’d like to address Ubisoft. Literally everyone hates Ubisoft. Why? I have no clue. They’re mad at the Watch Dogs downgrade. They’re mad at the quality of Assassin’s Creed Unity. They’re mad at the glitches in Assassin’s Creed Unity. They’re mad at the length of the South Park game. They’re mad at… what exactly? Sure, none of the items above are good. But they were things expected of a company like this. Companies are not evil, they’re not out to get you, they just want money. And they’re going to take action to make the most money no matter what, so why is everyone upset when they do something like this? Konami confirmed microtransactions in Metal Gear Solid 5. Suddenly people are canceling pre-orders and shouting at them to stop being greedy. Really? Optional payment to get stuff faster is bad? Might I stress “Optional”??? You’re going to not buy a game because somewhere in the code is a “pay” button? These are just my OPINIONS so please don’t judge me for my OPINIONS thank you ^-^. But honestly, is it just because I’m a developer that I’m siding with developers here? Or am I simply not in the AAA industry so I don’t expect AAA quality? What is making gamers nowadays so focused on graphics? Why are they so spoiled? And soon I will start posting more about my upcoming game Thanks for reading! Due to school and personal drama and other projects I have been absent from the game developer gig for a while. While I’ve stopped making smaller games and doing game jams I have been working on larger, non-game related projects. Hello! I just uploaded the timelapse for my entry “Defense of the Zorion!” Check it out! If you haven’t already, play the game here! So once again this game will be first person, however now I’ll be stressing upgrades and secrets and things to do within the game. You have 10 seconds for each wave, and each one gets progressively harder. You have to combine your own shooting with strategic turret placement in order to stop the waves of enemies! Consider me… *puts on sunglasses* IN! Hey RobProductions here, I’ll be joining LD again for Ludum Dare 27! This game will probably be first person (like usual). However, this time around I want to do something different… something that makes it more playable/replayable. Not just a simple puzzle game / platformer… I want to be able to play multiple systems against each other… if that makes sense… anyways expect me to be TRYING (may not succeed) at making a unique game. The comments said the problem was with the visuals. I agree. But visuals aren’t everything. I mean my game had more animation and gameplay options then Receiver (by Wolfire games) and that was one of the very first games to be Greenlit. The problem is people just look at the graphics. They just look at the “original” parts of a game, and even though I spent 300+ hours on complicated animation matrices, coding, and AI development, the visuals weren’t enough for people to take interest. I picked a random game to compare with mine. While the random game had somewhat impressive backgrounds and an interesting character design, they showed 30 seconds of repetitive walking gameplay. Looked like they had about 3 animations. And then they showed off some of their models and called it a game. And yet people are 300x more excited for it because their design is similar to that of popular mmos. Their game probably won’t have complicated animation matrices, AI systems with multiple states, and stealth scenarios that put you crawling inches from enemies. Their game probably doesn’t even have any complete levels. Now which game sounds more promising to you? A lot of comments said “You shouldn’t have put this game out in Alpha. You should’ve waited until Beta.” Well take a look at the game above. 30 seconds of walking gameplay, remember? Yet people weren’t even bothered by the fact that their systems weren’t developed at all and all they could show off was a walk-through demo. This has started to make me think… Do people base development progress on visuals? Because it doesn’t make any sense for people to just skim over mine because the graphics didn’t look so good. Did people even see what my game was about? Now call me a baby for complaining like this, but Greenlight is a flawed system. Personally I’d like to see how much work was actually put in to some of these entries. And by how much work I mean how many hours did they spend working on art and how many hours did they spend on actual gameplay. Sure the two go hand in hand, but people only look at the art, so what’s the point in working hard on the other part? ISSOS (New action adventure game) ANNOUNCEMENT! Anyways please consider voting and I’ll write more about this once more results come in! In my new action adventure game, one of the biggest goals I want to accomplish is to tell a compelling story. At first, this seemed like a difficult thing to accomplish… being that I didn’t have time to render and model a lot of cutscenes while perfectly lip syncing dialogue… In the end, I came to the conclusion of having little cutscenes and instead telling story through mechanics and visuals. How do you do that? Seems impossible, right? actually, if you go the basics, it’s quite simple. Mechanics. Text can tell stories. Audio can tell stories as well. Together these become vital aspects in presenting an easy-to-make story mechanic. Character biographies, journals, radio messages, all of these can easily show story without complicated cutscenes or even modeling other characters. However, this can get repetitive… The trick is telling the right story in the most interesting way. Word Choice. My original idea for the story of this game was a unique, slow paced action adventure that had the main character going through mostly the same locations over and over again, just in different scenarios. I quickly realized this was a mistake. You don’t need a ton of side characters… you need a few main ones that can do different things to help advance the story. It’s important to make sure all dialogue somehow progresses the story, and that the dialogue is from main characters. I want this game to be dramatic. I want to create scenarios that are unique as well as intriguing, and I want them to all affect the main character in some way. Making it Interesting. Start off with a story. Then think “How can I change this in the most dramatic way possible while still making it believable and understandable?” It’s hard to put what I’m trying to say into words… but basically you need to create dramatic suspense. Characters need to be at an even match, they all need to have something to hide, they all need to have weaknesses and strengths. Note: That is NOT the main character 😉 or is it???? So this game is turning out pretty well, I’m happy with how it controls and plays. I’m just about to start the heavy duty work on the combat system, so be prepared for a more action-oriented experience. Furthermore, I finished the cinematic trailer for the game. However I’m worried (seeing the other stuff on Steam Greenlight) that my game is not up to par yet. I know it probably has something to do with the art assets, but I’m no good at making super detail environments. This game, as always, started with the typical “fly up a wall” climbing system. This worked fine, but I knew I wanted to allow the player to reach higher places. I started doing some research and it turned out the best method for a climbing system was triggers — invisible “hot spots” that detect when the player is inside them. From that I was able to detect when a player was near a climbable object, and then disable the entire movement controller and hand over movement to special custom-made climbing controller. The details from there get a bit complicated, but so far this character is the most complex I’ve ever done in a game, with (right now) 5 layers of collision boxes, 3 state controllers, over 20 animation matrices, and more than 60 basic animations. I’ll do a more detailed write up (and maybe a video) about development once the game is announced. You’ll be sure to here more development news soon! 34 queries executed in 0.129 seconds.